Can we manage a whole month on Office Web Apps alone? Microsoft Office is one of the most ubiquitous application suites on the planet, and it's used in pretty much every business, school and home in the country. Its programs enable people to do almost anything using their PC, from creating documents for work, school or home to doing their accounts and making presentations. At Windows: The Official Magazine, we love Office 2010, but there's one thing that always causes contention: the £100 price tag. That's about to change, though, as Microsoft is now offering a portion of its Office 2010 suite for free on the internet. The service is called Office Web Apps, and it has been plugged into the existing Windows Live SkyDrive service, which provides all the online storage capabilities. Microsoft has designed the service to be an extension of the Office 2010 environment for people while they're away from their PCs, rather than an alternative. The rules of James' challenge are simple: he must uninstall all copies of Microsoft Office from his PCs at home and at work. 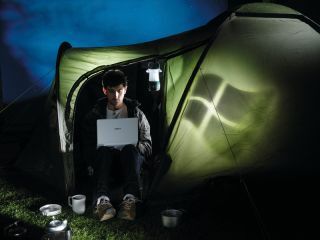 For 30 days, he can only use the online Office Web Apps available from http:// office.live.com in a bid to find out whether it's possible to survive on free software alone. If he resorts to using the paid-for suite, James will fail the challenge. Unlike the beginning of most issues of Windows: The Official Magazine, my morning doesn't start with a heavy load of writing. Instead I find myself uninstalling Microsoft Office 2010, the most essential tool for doing my job, just as I'd done at home the night before. As a writer, I use Microsoft Office 2010 every day, and even in my spare time. It's easy to take things like Windows and Office for granted, until you're forced to do without them. However, I don't feel I use a great deal of the tools included in Office, so I'm fairly confident I'll be able to use Office Web Apps without too much trouble. My first job is to start writing a tutorial for the magazine. Instead of firing up Office Word 2010 from the taskbar in Windows 7, I have to start up Internet Explorer 8, navigate to http://office.live.com, log in and load a new document. This is far more time-consuming than opening Office Word, and the thought of doing that each time I want to create or load a document seems soul-destroying. To make things easier, I place a link to the Office Web Apps on my browser's favourites bar, and pin it to the Jump List for Internet Explorer in Windows 7. My first impression of the Word Web App is positive – it has a familiar feel for anyone who's used to working in Office Word 2007 or 2010. There's a Ribbon menu, with most of the same buttons and options found on the full paid-for suite, but it's not until you look closely that you realise a lot of the tools are missing, and there are only three tabs rather than seven. Writing for the magazine doesn't involve many of the options in Office Word, so I get down to work. Writing is easy enough in Office Word, but halfway through my tutorial I come across a missing feature that threatens to scupper the whole challenge. To my surprise, there is no word count tool in Word Web App, which makes keeping to the strict guidelines almost impossible. In a bid not to fail so early, I turn to www.wordcounttool.com to keep track of my paragraphs, but the frustration of copying and pasting text across browser windows nearly drives me to distraction. Little do I know, more problems are already on the way. Restrictions such as the single screen view start to make writing in Word Web App quite irritating, as I like to write with the text quite large on the screen, and will often use the Ctrl and Scroll wheel zoom feature to review work and make changes. In Office Web Apps, you're stuck with a single huge page with small text, where a single line can contain as many words as a paragraph. That problem also compounds the issue of struggling to adhere to word counts, and it's going to take some getting used to. In short, the next month is going to be a lot more testing than I thought. Four days into the challenge and the strain of swapping to the Office Web Apps is already starting to show. After using the service on a daily basis, it's more than just the word count that's missing from my daily routine. There's no grammar check, which means I need to be extra vigilant, and the lack of viewing choice makes displaying documents a pain. There are two views: the editing mode and reading view. This would be good to work in, but the text is placed into read-only mode, so there's no chance of making any changes. After my first week, and the daily struggle of using Word Web App to write, the chance to start using the Excel Web App comes as light relief. At the beginning of a new issue, it's my job to work out who writes what and commission our talented pool of writers. The information is held in an Office Excel spreadsheet, but with no copy of Office, this needs to be uploaded to the web. The first step is to upload documents to my Windows Live SkyDrive account by logging in using my Windows Live ID at http://skydrive.live.com. Then I simply open them for editing in Excel Web App within Internet Explorer. Having used free spreadsheet programs in the past, I'm instantly impressed at how well the complicated system we use for our features lists is represented in Office Excel Web App. The formulae all work fine and I am able to make amendments to the sheet. What's more, when I do make changes, these are in the same style as the original, and if I were to use this version of the document with the offline version, there wouldn't be any problem going back to the full Office 2010. However, it isn't the way Excel Web App handles the formatting challenges that impresses me most – it is the ability to share with others. At the moment, we use a versioning system for our offline content for the magazine details list, but when placed online, I am able to share it with other members of the team, so they can all make amends as well. In the Windows Live SkyDrive menu, click Share next to the document. You can choose to edit permission levels so your contacts, or even anyone in the world, can see your documents. You can then generate a link, which guides people directly to the document.